Hello! I just got a new 55-300mm telephoto Nikkor Lens; will this lens be any better than my older Nikkor 45mm macro Lens when it comes to photographing amphibians at night? What is a good lighting tool for an off-camera person to light the amphibians with? Will a tripod be necessary? Last question, what is the absolute BEST lighting for taking a decent photograph of amphibs at night without damaging any eyes? Camera flash? Off-camera flashlight or LED? I've tried various lighting tricks, so many times out in the field and I've always ended up with terrible blurry pictures (which is incredibly frustrating) . I'm trying to stock up on helpful information for next summer's Arizona monsoon herping trips. Much help would be appreciated, thanks! I just realized some mistakes in what I typed. Just ignore those though, lol. I'd probably still stick with the 45mm macro, depending on what sort of night shots you're planning on getting. Probably best would just be to experiment with both and see what you like. I'm not sure if it was posted here or elsewhere, but one trick I'm keen to try out is using a laser with something like a # pattern for the camera to focus on. Then, you can use a flashlight that is bright enough to see what you're doing, but may not be bright enough for the camera (the laser will supposedly allow the camera to focus - the pattern is important, having both vertical and horizontal lines, rather than just a point). As for what to use for decent photos, I'd go with an off-camera flash. In my experience, using LED lights leaves the picture too cold (and unless you have a slow shutter/low aperture/high ISO or bright flashlight, most flashlights do not provide enough light for camera sensors) and using non-LED flashlights leaves the photos too warm. Flashes are the right temperature for photographs, IMO. I don't think you need to worry about damaging eyes, unless you plan on putting the flash right next to the herps' eyes. That said, most mid-to-upper level flashes will allow you to control the output, so you don't have to shoot at 100% all the time. Most of the time, I shoot anywhere from 1/16 to 1/4 with a diffused flash. For most of my night shots, I do not use a tripod. My basic starting point for night photos is ISO 100, f/11 or f/13, and 1/200s shutter. I'll adjust things if I want more background to show up, I'll adjust accordingly and slow down the shutter speed or lower the f-stop. Your blurry photos, if they're with flash, probably are because the shutter speed was too slow. If you are shooting in the dark with flash and getting blurry photos, something weird is going on. In theory, your camera flash only fires for a few thousandths of a second so even if you have a slower shutter speed, any motion will happen when there is no light. Of course, if you keep the flashlight on the animal during the shot, then you can get blur. Figure out what your camera's max sync speed is and shoot up near that level. Move the flashlight away from the subject right before you take the photo. Be careful doing this because some species (particularly Ranids) will sit still as long as a light is on them but the second you move it they bound off into the dark. For simplicity, I like the effect I can get with a camera mounted flash with a diffuser on it. I like the Stofen Omni-bounce diffusers because they give a good diffuse light while being very easy to use in the field. Sure, you can get better light with two flashes and two diffusers carefully positioned, but sometimes you just want to get a good shot and don't have time for an elaborate setup. I actually take most of my amphibian shots now with my Metz Mecablitz Macro Flash with two homemade plastic diffusers on it. It is field hardy, easy to use and set up and gives me nice even lighting when I am within a foot or two of the subject. As I stated in the other thread you started, there really is no reason to worry about flash hurting the animals' eyes. I think off camera flash, using a bracket, (I personally like the Wimberley Macro Bracket-http://www.fieldherpforum.com/forum/vie ... 15&t=22374), is the easiest and best method when you need to slosh around in some pond after dark. A single flash on a bracket like this provides nice, directional, yet often still very open lighting. A lot depends on how far away you are from the subject. You can always add diffusion to the flash to soften it up if you like. If your camera's built in flash will work as a master, (all but the entry level Nikon DSLRs will), then you don't need any other chords, etc. If you have an entry level Nikon then you can get a TTL chord, (I still have an old SC-17 and it works fine with the newest Nikon cameras and flashes, just no AF assist light). I always use my flashes in TTL. Some people prefer manual, but I've found Nikons are very accurate with TTL and its just easier when you change distance frequently. As far as what to have an assistant hold on the frog for focusing, I've found a dim flashlight works best. You want it just bright enough to frame and focus. Sometimes if the only flashlight I have with me is too bright I'll aim it at the frog so that only the dimmer outside part of the light cone illuminates the frog. I'd like to experiment more with red focusing lights, but all the ones I've tried have been too dim for me to focus well. I usually work alone, so I rarely have anybody along to hold a focusing light for me. What I do instead is to use velcro to attach a small flashlight to the top of the flash. This gives me a focusing light and helps me make sure I've aimed the flash correctly, though since I usually have the flashes set to their widest zoom setting I can actually be a little sloppy in my aiming and still get the subject properly lit. I don't turn the flash light off before taking the picture. That simply doesn't work when you are hand holding and since I'm using a fairly dim flash light anyway it gets completely overpowered by the flash. 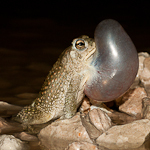 I love tripods and use them frequently, but not when photographing nocturnal amphibians! As far as what lens to use, I would go for the 55-300. The 45 is going to be too cumbersome in the field, what with it having only manual focus and a pretty short working distance. You don't need the tilt and the shift features of that lens for frogs either. To use the 55-300 though you'll need to purchase a diopter. I often use the Nikon 70-300 vr with a Nikon 5t for calling frogs. Since your 55-300 has a 58mm filter I would buy a Canon 500D diopter in that size. The nice thing about the zoom with the diopter is that you can zoom to change your magnification and framing from the same spot. Image quality when you stop down into the f11 or so range, (where you need to be for macro stuff anyway), should be quite good, though I must admit I've never used that particular combo.